While walking through Antwerp on a Sunday evening we spotted the Imperial Cafe. The menu looked very inviting, well the selection of tea time offerings convinced us to visit later in the week. 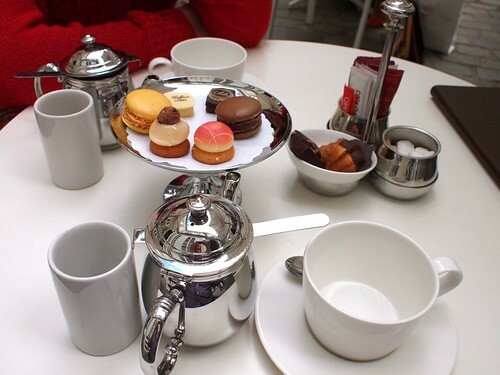 We ordered a tea time selection and it was all beautifully served. Deciding which single estate tea to drink did take a little while but it was worth the intellectual effort when it arrived. We looked forward to trying our first Belgian chocolates made and served in Belgium. However, we had coca-cola flavoured and curry and saffron flavoured chocolates. Both were very different to any chocolate we had tried before! The coca-cola one fizzed like fizzy sweets from childhood and the curry flavour was mild but noticeable. The chocolate did have a lovely smooth silky consistency though!